Photographed by Frank Hurley, South is the film record of Sir Ernest Shackleton's heroic but ill-starred attempt to cross Antarctica in 1914-16. It is both a unique historical document, and a tribute to the indomitable courage of a small party of men who set out on a voyage of discovery that turned into an epic struggle for survival. This restored version of the film has been constructed by the BFI National Archive from a wide range of materials. The Archive has applied its own tinting and toning to match the original prints, and has produced this handsome and richly coloured testament to a remarkable episode in the history of exploration. With thanks to the Royal Geographical Society for access to their stills collection. 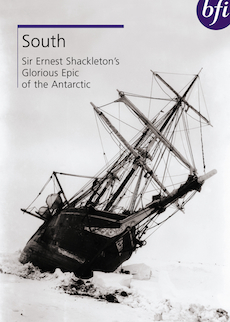 The James Caird Society exists to preserve the memory, honour the remarkable feats of discovery in the Antarctic and commend the outstanding qualities of leadership associated with the name of Sir Ernest Shackleton. The restored version of the film has been constructed by BFI Collections at the J Paul Getty Conservation Centre. The painstaking restoration used a wide range of materials, including a print and negative deposited by the distributor Sir William Jury. Contains optional subtitles for the hearing impaired. With thanks to the Royal Geographical Society for access to their stills collection.The James Caird SocietyThe James Caird Society exists to preserve the memory, honour the remarkable feats of discovery in the Antarctic and commend the outstanding qualities of leadership associated with the name of Sir Ernest Shackleton.The Restoration of SouthThe restored version of the film has been constructed by BFI Collections at the J Paul Getty Conservation Centre. The painstaking restoration used a wide range of materials, including a print and negative deposited by the distributor Sir William Jury.